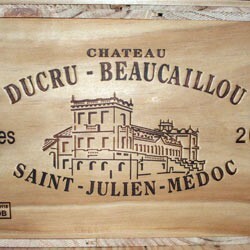 Produktinformationen "Chateau Ducru-Beaucailou 2008 (Chateau Ducru-Beaucailou)"
One of the stars of the vintage, and a remarkable achievement in 2008, with impressive richness, this dense purple colored wine is almost as opaque as the 2010. Spring flowers, crushed rocks, creme de cassis and some subtle oak are followed by a full-bodied, concentrated wine that transcends the vintage character in its power, richness, and aging potential. It also exhibits tremendous precision, purity, and depth of character. It is more forward than the 2010 is likely to be, but probably not as sumptuous as the 2009 will turn out to be. This is a wine to buy. Weiterführende Links zu "Chateau Ducru-Beaucailou 2008 (Chateau Ducru-Beaucailou)"
Unser Kommentar zu "Chateau Ducru-Beaucailou 2008 (Chateau Ducru-Beaucailou)"